As I write this, it is Easter Sunday in Budapest and the church bells are ringing. I’ve been away from Israel for 10 days so I don’t honestly know whether fresh almonds are even still at the market. Two weeks ago, they were there. Not in Be’er Sheva, of course, but in Jerusalem (and I hear Tel Aviv). 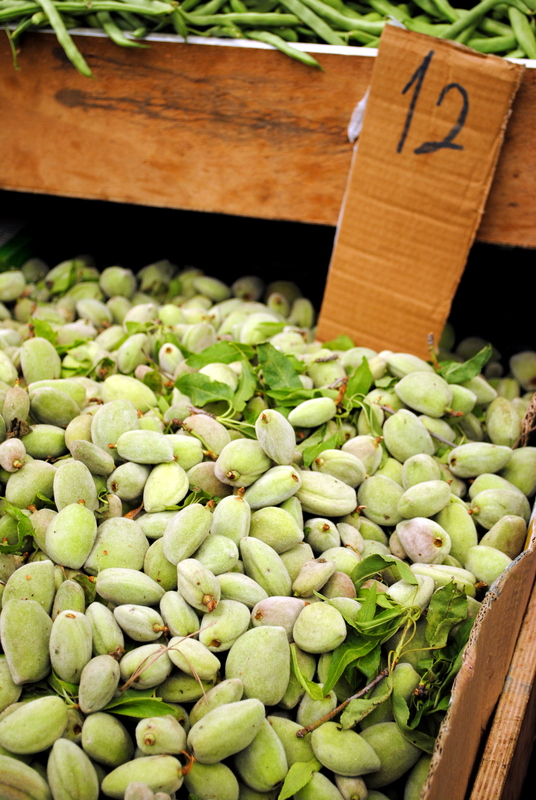 They were in such abundance it was easy to forget that their season typically lasts a few short weeks (the Almond Board claims they are available April through June). Somehow, fresh almonds seem appropriate for Easter. Rebirth and all that. 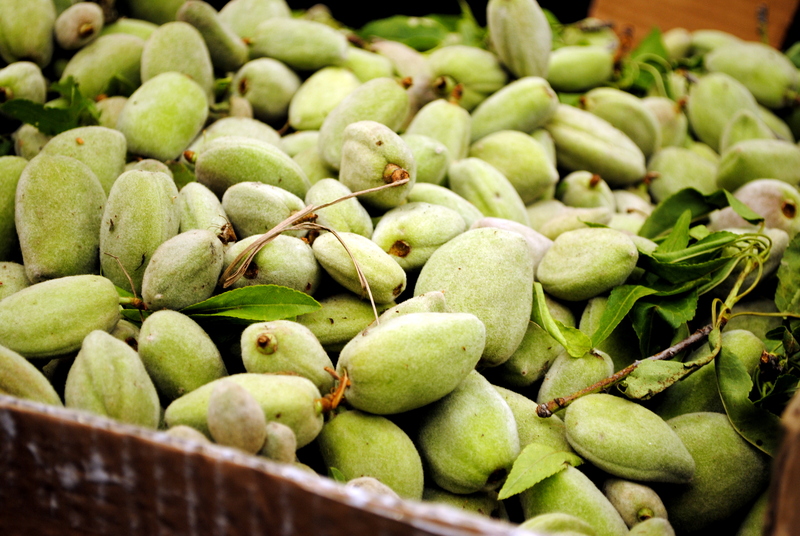 Although I had heard of fresh almonds, and even had them once before (the chef at Castagna in Portland, OR puts them to good use), I didn’t immediately recognize them at the market. 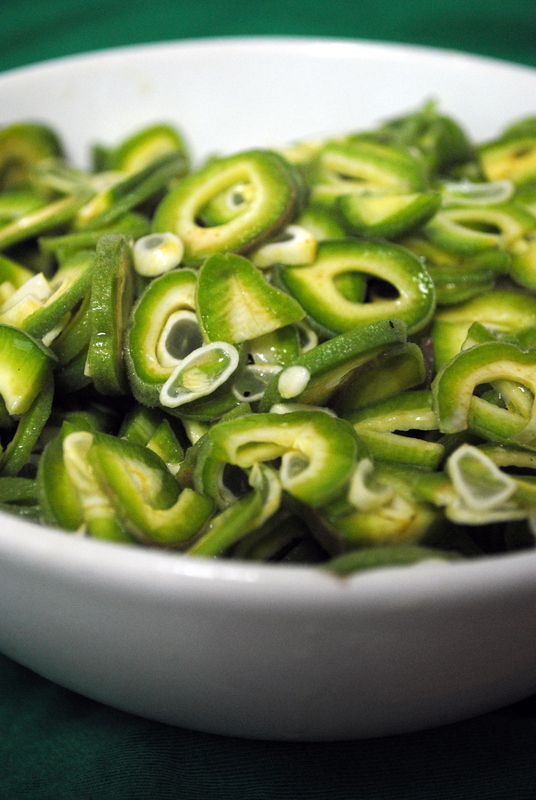 I noticed them while on Tali Friedman’s culinary tour of Mahane Yehuda (more on that later) and asked what they were. “Fresh almonds,” she said, and handed me one to try. I looked at it quizzically, not quite sure what to do with it. “Just eat it,” Tali explained, taking a bite out of one. So, when preparing fresh almonds it’s important not to overwhelm this fresh, clean flavor. Lemon, used in moderation, is a lovely complement that brightens the almond’s flavor. The simplest preparation is the best: slice the fresh almonds thin and toss with a little lemon juice, high quality olive oil (preferably one that is slightly fruity but not too strong in flavor), and salt. I tried adding Parmesan and found it to completely overwhelm the fresh almonds. Their flavor is easily overpowered. Tali included thinly sliced shallots in her rendition, which were lovely as well. When I made the salad most recently, it served as the perfect, refreshing foil to a heavy, comforting bowl of macaroni and cheese. There were fresh almonds all over Istanbul! Here’s hoping we have some in Beer Sheva this week!! Wow, I didn’t know that’s what almond looked like beforehand. Can you eat them like that? I know! I hadn’t seen them like this either. When they are very young like they were here you can eat the entire thing, fuzzy green outside and all. There is only a hint of the almond to come in the middle and they don’t taste like almonds at all – they just taste, well, green. As they mature the outside hardens and the almond inside materializes. At that point the outside becomes tough and bitter but the almond inside is tender and white. I guess at that point they dry or roast them to make them look like almonds we get in the store?